The Pre-Kindergarten Program provides a challenging environment of directed freedom for 4-year old children. The program nurtures the spiritual, intellectual, physical and social-emotional growth of each child. It provides active, hands-on learning based on the knowledge of HOW and WHEN a child learns and develops. Our curriculum also encourages the growth and development of large and fine motor skils. 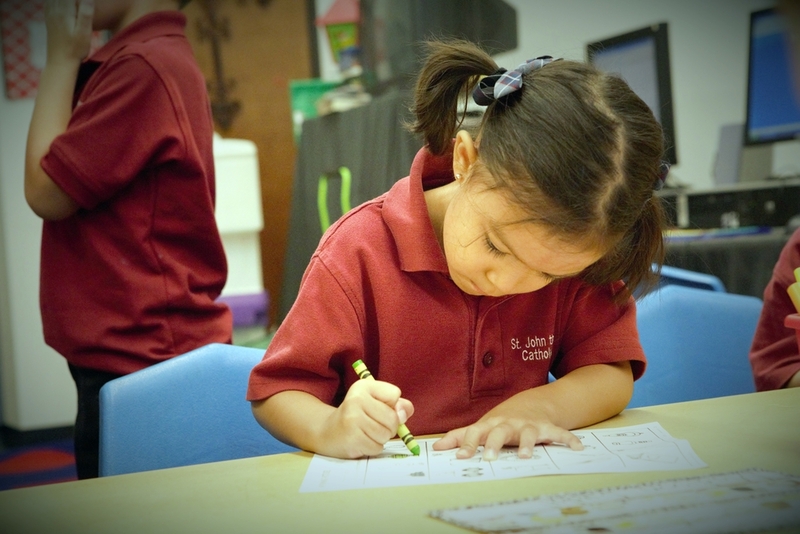 Pre-Kindergarten students attend religion class daily. This includes the formal teaching of gospel values and age-appropriate faith concepts. It is a time to pray and celebrate “church” together. Students also attend the school&apos;s weekly mass with their 5th grade prayer partners. Curriculum is “phonics based.” Each letter of the alphabet represents one or more sounds. When the phonetic sounds are mastered, reading is the next step. Math development involves the ordering of their world, giving them a sense of order to the abstract. Students all have weekly classes in music, spanish, PE, and library. Students in Pre-Kindergarten through eighth grade wear uniforms which must be purchased from Miller Uniform Company. Our school ID number is 3420.